Cascadia Art Museum’s “A Spirit Unbound: The Art of Peggy Strong” reveals an intriguing artist whose life was cut short and who never entirely found her style. The woman may be alive — but she’s laboring under considerable difficulty. Peggy Strong’s untitled oil-on-canvas from the late 1940s is a remarkable painting. 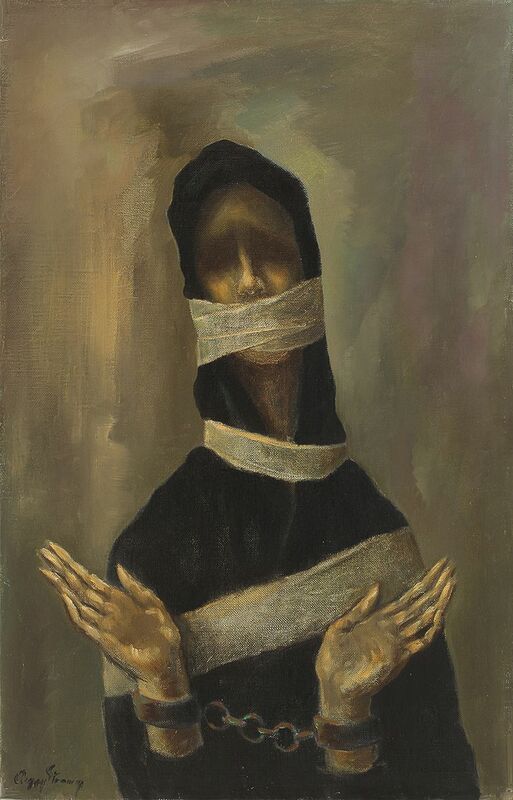 Its sepia-lit female figure — mouth gagged, wrists chained, eyes being swallowed by shadows — seems, with her raised hands, to be imploring the viewer to help her. Along with a dozen other paintings in Cascadia Art Museum’s “A Spirit Unbound: The Art of Peggy Strong,” it justifies taking another look at Strong’s career and brief life. But the show also reveals an artist who never entirely found her style. Strong (1912-1956) came from a well-to-do Tacoma family. Her father was a civil engineer who worked on the North Cascades Highway, and when she was paralyzed from her torso down in a car accident at age 21, he built her an elevator that let her work on large projects, including murals for the Wenatchee Post Office and Tacoma’s Union Station. 11 a.m.-6 p.m. Wednesdays-Sundays through Jan. 8, Cascadia Art Museum, 190 Sunset Ave., Edmonds; $7-$10 (425-336-4809 or cascadiaartmuseum.org). The murals are documented with photos and news clippings in “A Spirit Unbound,” but the actual works on display are medium-sized oils on canvas. They vary widely in quality. Strong earned some income as a portraitist and, while she clearly had a technical facility, too often her gauzy images of friends and family feel sentimental. But when she looks inward, communicating in a symbolist shorthand, her work comes alive. Its lines grow sharper; its colors take strange and challenging turns. In “Hate,” a dozen blood-red figures crouch in a ritual circle, as if about to pounce on an unseen target. It’s a hellish, ferocious vision. “Rain” initially seems its opposite, but the way its gray silhouetted figures are dissolving under streaky raindrop-translucence suggests a similar collective fate or doom. Strong sometimes employs wild contrasts of color to disruptive psychological effect. 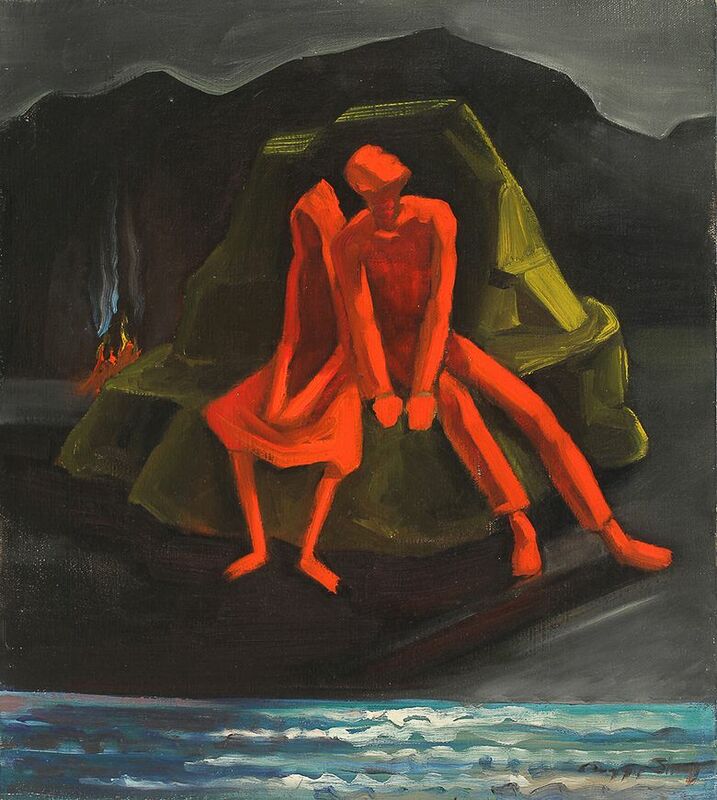 In “The Picnic” (circa 1948), two slumped figures — one male, one female — are rendered as lurid red, featureless outlines, perched on a seashore boulder with no picnic in sight. Against their backdrop’s dim green-gray, they couldn’t look more uncomfortable or unnatural. Not every painting hints at feelings so dark. “Prairie Fire” shows a circle of galloping horses as energies of green, orange, gray and red, caught in a sharply tilting landscape. 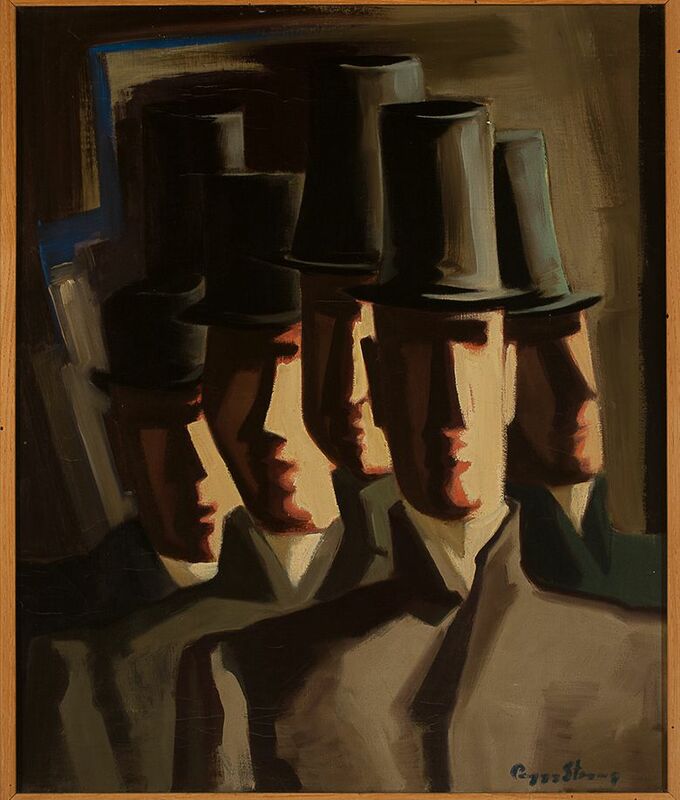 The top-hatted gents in “Gentleman in Black Hats” are an excuse to play with masculine profiles. There’s a sassy swagger to “Woman with Green Hat,” its distortions of line and shadow suggesting a figure of captivating verve. Something similar, if less showy, is conveyed in “Lady in Green,” its bold lines and subtle elongations hinting at someone shrewd, wary and utterly composed. Even portraits aimed at satisfying conventional expectation do canny justice to their subjects in a few cases. 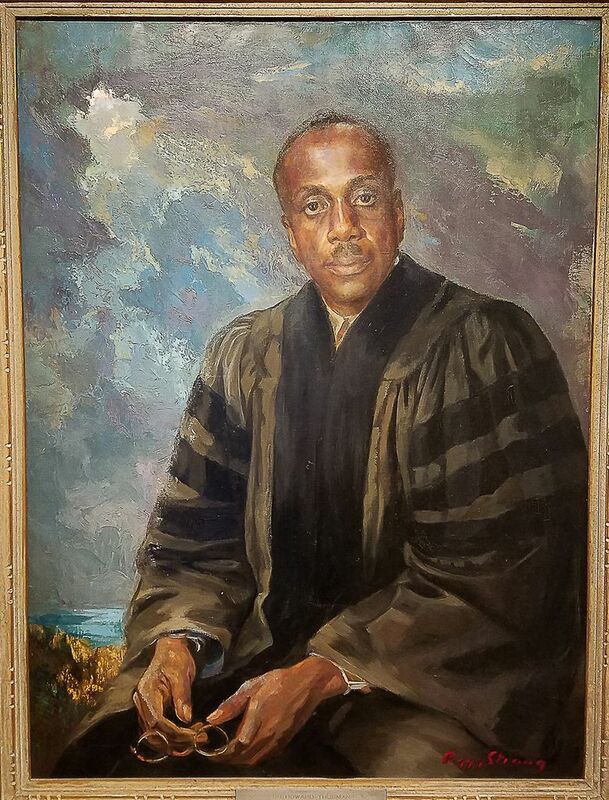 “Portrait of Dr. Howard Thurman,” of a civil-rights leader who influenced Martin Luther King Jr., reveals a strong, resilient soul against a turbulent sky and seascape. In “The Sisters,” two African-American siblings make an equally powerful impression, leaving the blander portraits of Strong household members in the dust. David Martin, of Seattle’s Martin-Zambito Fine Art, curated the show, as he has all of Cascadia Art Museum’s exhibits since it opened in 2015. It would be helpful to have an essay from him, explaining why Strong is so inconsistent in style. Were her experimental paintings personal works that she could indulge in less often than her portraitist-for-hire pieces? A documentary accompanying the show gives a useful account of her life, but doesn’t answer all the questions this retrospective raises.